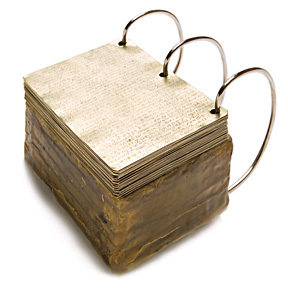 One may wonder just what does the LDS church mean by the Gold Plates from which the Book of Mormon was translated. I have grown up in the Church of Jesus Christ of Latter-day Saints. I grew up singing about the “Gold Plates.” There is a Primary song that goes like this, “The golden plates lay hidden deep in the mountain side.” Joseph Smith was directed by a heavenly messenger to a place on the Hill Cumorah in upstate New York to dig up a metal box containing metal plates and other artifacts. These are referred to as the Gold Plates. From those plates, under divine inspiration, he translated the Book of Mormon. This is my heritage. Yet, I recognize that to others, this idea of finding metal plates with ancient writing, dating back to 600 BC, might seem like a far-fetched idea. Is that plausible? The world of archeology is always filled with new discoveries. That’s the passion of archeology. Have there been other discoveries an ancient plates? To answer to that question is a resounding, yes! There has been a treasure trove of ancient records written on both papyri and metal plates discovered in both the New and Old Worlds. Research and documentation has been extensive. Paul Cheesman, a noted archeologist, wrote the following in an LDS Ensign article. What did the Gold Plates look like? They had the “appearance of gold.” It is never stated that they were made of pure gold. “Many critics have been quick to point out that if the record was made of solid gold it would have weighed much more than a person could lift. Besides being too heavy, thin plates of pure gold would not function well as a book. The metal would be so soft that it could easily tear from the rings, and engraving would be limited to one side. They were about 6 inches by 8 inches and about 4 inches tall. They weighed from 40 to 60 lbs. They were bound by three “D” shaped rings. A portion of the plates were sealed to the point that they looked solid. There were fine engravings on both sides of the plates stained with a black, hard stain to make them more readable. The writing was from right to left, consistent with the Hebrew language. At the top of this blog I’ve included an image of the official facsimile made by the Church of Jesus Christ of Latter-day Saints for the Church History Museum. Here is the statement by Kirk Henrichsen concerning the making of the facsimile. “In an attempt to be as accurate as possible, all known statements about the plates were compiled and compared. Unfortunately, there was not space in this article to include all of the descriptions. We do not know the monetary value of the Gold Plates, but it is certain that such an archaeological find would be highly sought after. Joseph could have sold them for monetary gain, and in fact, was cautioned by the angel Moroni that he would tempted to do so. The following is from Joseph Smith’s history. Thanks be to Joseph that he was true to his calling! To honest truth seekers the value of the plates is in the eternal truths that it contains, the testimony of Jesus Christ that permeates it pages. Would actually seeing the plates increase the likelihood of one believing that it is true? Perhaps it would motivate one to investigate further, but that investigation must be done with a sincere heart, with real intent, and with faith in Christ. For me I do not have to see, to believe. As Jesus said to Thomas,”Blessed are those who have not seen, yet have believed.” Truly that is the beginning of a testimony of the truthfulness of the Book of Mormon. I think the information about the appearance of the plates is fascinating. I like to picture them and picture Joseph translating them. I love the story of the coming forth of the Book of Mormon, but this is not where my testimony comes from. I have read the Book of Mormon many times and have had a spiritual witness that it is true. I invite all who read my blog to do the same. This entry was posted in Book of Mormon construction and tagged Book of Mormon, Christ, Church of Jesus Christ of Latter day Saints, Gold plates, Joseph Smith, Mormon, Mormons, Moroni, witness of Christ. Bookmark the permalink.